Outside of our Pan-Asian fusion cookbook, our team at Taxiboat has one heck of a recipe to make our Melbourne restaurant a real success story. First, we carefully select a fusion recipe, then we select the freshest Australian local produce for the dish. Regular twice weekly deliveries ensure that our supplies are fresh. We do not use MSG or corn oil, cater for our gluten free/fodmap/vegetarian/vegan customers. We promote Australian wines and we have vegan friendly, bio-dynamic, organic and sustainable wines. 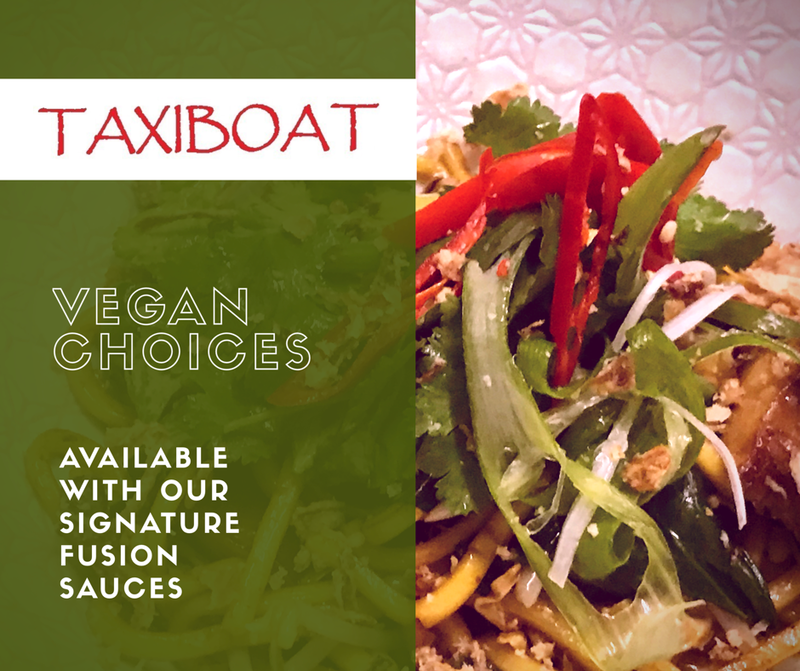 Vegan choices are now available in Taxiboat with our signature fusion choices. We constantly ensure the stylish dining space is kept absolutely spotless, then, lastly, there’s impeccable service that demonstrates warmth, graciousness, efficiency and knowledge. Sound too good to be true? Well diners, it isn’t. You can find our fantastic restaurant on 94 High Street, Northcote and we know you’re going to love it. Looking for awesome food delivered to your doorstep? […] The staff were also extremely accommodating and friendly and even asked us if we were seeing a movie to make sure we had enough time and to speed things up. Highly recommend Taxiboat for a pre-movie meal or nice night out! Looking for a great restaurant on High Street, and contemporary Asian then look no further. Taxi boat has a wonderful service, their Pork Bun, was the best ever. You will not be disappointed. And right opposite the Westgarth Theatre. […] Food was very nice and tasty. I was pleasantly surprised. Presentation was superb and the taste that followed was very very nice. Lots of subtle flavours there to please everyone. Highly recommend this place. Lovely food, atmosphere and service. A special place for a special celebration. Delicious dumplings. The Taxiboat Special Fried Rice and Hokkien Duck Noodles were as good as I have tasted. Service was efficient and friendly. Will definitely go back. Cosy restaurant with hot, fresh delicious Asian food! Gluten free options are plentiful which is always appreciated. Spicy Kung Pao Chicken a must! Will definitely return. Beautiful fresh tasty food and great friendly and attentive service. Always a pleasure. Wonderful place to celebrate that special occasion or to grab a quick dinner before or after the cinema. A firm favourite! Friendly service. Beautiful food and lovely setting. Food is fresh and value for money. Staff are wonderful with our children. We will definitely be back. We are pleased to hear some feedbacks from customers to improve our services’ quality.